Story by Les Tan. Pictures contributed by reader Jolyn Ang. RedSportsTV by Les Tan. 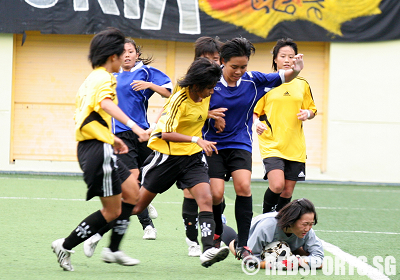 Jalan Besar Stadium, Wednesday, May 14, 2008 – Victoria Junior College replaced the bitter memories of last year’s 0-1 final loss to St Andrew’s Junior College with sweeter ones, when they won a penalty shootout 6-5 against the same opponents last week in the final of the National A Division Girls’ Football Championship. The game ended 1-1 at regulation time and extra-time failed to produce a match winner, thrusting both teams into the dreaded penalty kicks. Unfortunately for the defending champions, Saints, Narmadha Kamalanathan’s penalty was saved by goalkeeper Joan Huang of VJC after all five previous kicks were converted. The job was still incomplete however, with striker Chen Wan Xin of VJC still needing to score to win the shootout. 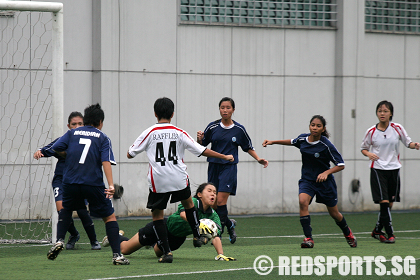 After kissing the ball, Wan Xin placed her shot to the left of Saints’ keeper Rebecca Chow. Rebecca guessed the right way but was unable to stop the shot, sparking an emotional celebration on the pitch as the VJ team poured onto the field. 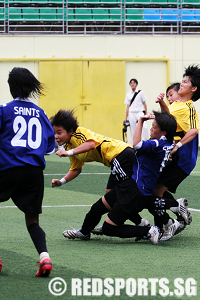 In a game of few clear chances, Saints scored in the first half when VJ keeper Joan Huang spilled a free-kick, allowing Sherlyn Koh of SAJC to tap into an unguarded goal. Ang Kuan Ren of VJC, who won the Most Outstanding Player award at the end of the game, showed off some off her shooting power in a dead ball situation in the first half when the Saints keeper couldn’t hold her shot and dropped it. However, no VJ player was near enough to put the ball away. Having lost last year’s final because of a goalkeeper error, VJC hearts would have been shattered if they went down 0-1 again for the same reason and so there was intense joy mixed with relief when Chen Wan Xin scored in the 55th minute of the second half off a corner. 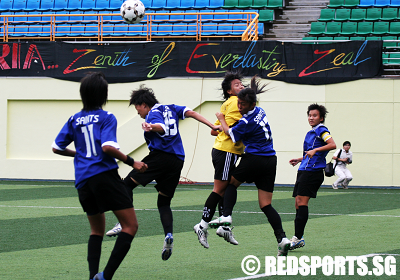 Kuan Ren, who took all the corners for her team, swung in a hard cross that eluded everyone. 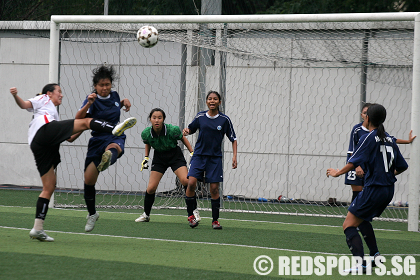 The ball bounced once and Wan Xin met it at the far post to head it into the net. Saints, with key striker Maria Rowe with a knee injury that reduced her to hobbling pace towards the end of the game, were unable break down a stubborn VJ defence and it became inevitable that the game would head to extra-time. When extra-time produced no winner, penalties loomed, with the VJC coach allowing the players to volunteer for the penalties with a show of hands. As with any penalty shootouts, only the brave take them, and even though Saints’ Narmadha missed, it could just as well have been somebody else on the day. As things turned out, it was goalscorer Wan Xin who had the responsibility to score the final penalty to ensure the win. 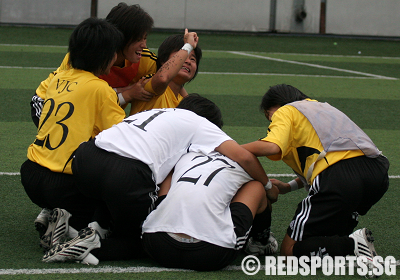 When the penalty went in, she sank to her knees in tears as her teammates crowded around. With that one kick, the memory of last year’s loss was washed away with the joyful tears of this year’s victory. 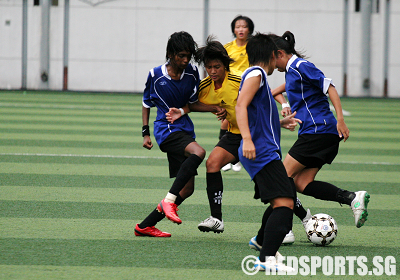 In the match for 3rd and 4th, Raffles Junior College beat Meridian Junior College 1-0 through a goal by Yeow Ting Wen. Great site here! Thks for the wonderful coverage of the games. 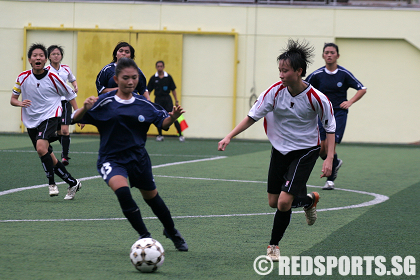 Both SAJC and VJC had come a long way in girls soccer. I’m sure both teams have great respect for each other. We both play hard and fight hard for our schools. It is interesting to watch how the two teams develop and improve over the years. What makes girls soccer for each team interesting is that you know that the other team is on your back when you are training. it motivates you to train harder. Anon, i’m sure that it is up to the choice of the individual as to whether they want to join VJ or SA’s soccer when they switch school. It’s not up to you to comment whether it’s good or bad. I’m sure even if these ex-sa girls saw how VJ won the game, they won’t be JEALOUS of VJ’s victory, or of what they could have achieved. You can see these girls as obstinate or they respect/ love SA too much to want to play against them. Or u could see the ex-VJ girls that joined SA’s team as being open or love soccer too much to give it up. Seriously, from where you are coming from, does that mean that those ex-VG girls that joined SA should not have done so becoz VJ won? May God bless the two teams! Whoo! #15 Joleen Tan! Well done saints, hard fought match. Good job everyone!! Was amazing at how hard everyone fought, one day I want to be just like you too! It was a match that kept us on the edge of our seats! A very closely fought match that could have gone either way. VJC did well to fight back after trailing 0-1. Credit to their determination and self belief. SAJC played their hearts out too. 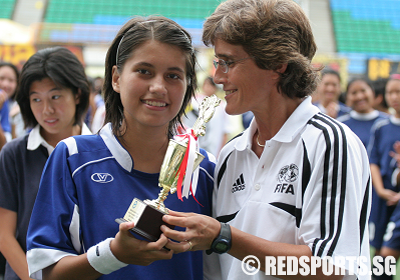 The real winner is Singapore Girls’ Soccer!